Today we have one of our favorite guests, returning for another interview. 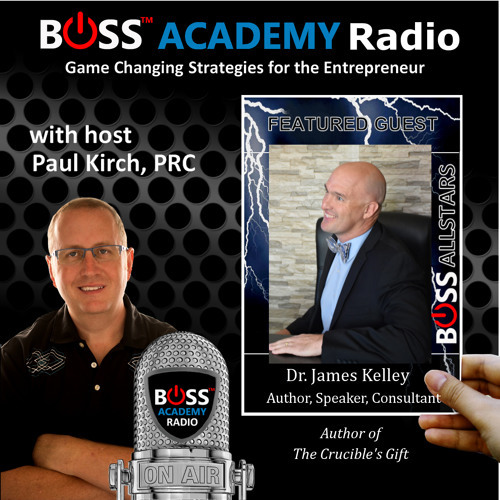 Author, speaker, and consultant, Dr. James Kelley, was born in Portland, Oregon. Following the completion of an MBA and a year of teaching English in Japan, James moved to Australia to pursue his Ph.D. in International Marketing. He is the host of the Executives After Hours podcast, where he states, “I care about who you are, not what you do. Because who you are defines what you do.” Kelley currently teaches at United Arab Emirates University, and resides near Dubai with his wife, Mary, and their four children.&nbsp; We're discussing his exciting book, The Crucible's Gift, which shares 5 Authentic lessons from leaders who thrive in adversity.&nbsp;The Crucible’s Gift introduces you to lessons from 140 diverse leaders who demonstrated the art of living more authentically. Combining these rich, raw and insightful stories with his knowledge of business and psychology—as well as his candid accounts of what he has learned from his personal crucibles—Dr. Kelley shows how to transform what holds you back into traits that will propel you forward, encouraging you to step fully into your life.